We continue our story after the hole, 180 meters deep, has been cleaned out. Now came time for the pump trials, which show how much water can be pumped out of the borehole without the water level plummeting. These tests also determine the type of pump and engine that must be used once the borehole is equipped. After six hours of constant pumping, the water level hardly budged, indicating that the aquifer is bountiful. Denis and our local representative, Moumine, visited households inviting villagers to fill up all their water containers and jerry cans during this process. Once the pump trials began, nomads and villagers from far and near came to fill as many containers as they could handle. Donkeys pulled wagons covered with ten or more jerry cans and barrels. 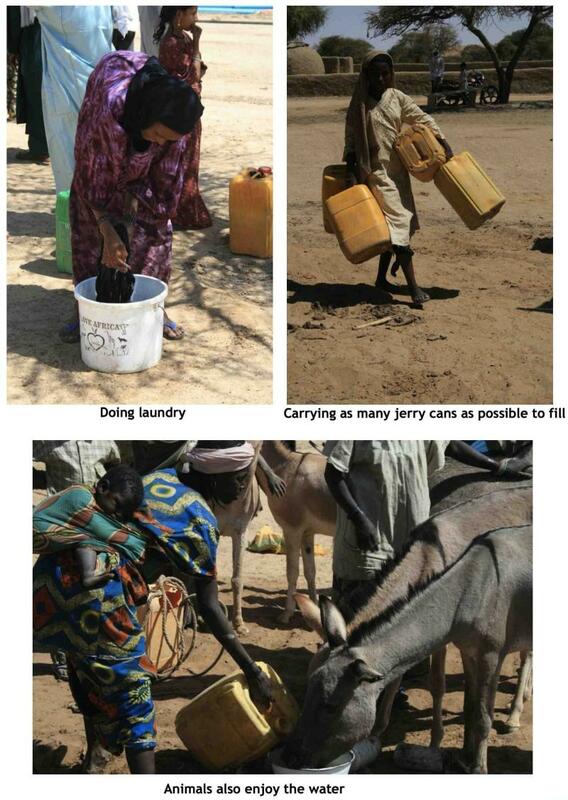 Men, women and children carried up to five jerry cans, and waited patiently their turn. Women did their laundry, and children bathed in the runoff. A group of four young girls washed their hair. More children sang and danced, this time jumping in the puddles formed by the water. Even the animals drank to their heart's content. Please help Amman Imman raise $50,000 this spring!